Across the last decade popular narratives of running have broadened considerably to include the ethnographic, the anthropological, the geographical. The cultural turn is increasingly apparent, as is, but much more emphatically, the biological and medical: the former introduced by Bramble and Lieberman’s ‘born to run’ thesis (Nature 2004) the latter a response in part to that work, focused on the long-term impact endurance training might have on cardiac function. The runner’s body and the act of running have become culturally significant, its literatures reflecting this and far out weighing – if one goes by the shelves of Waterstones – instructional training texts. In a dialogue that takes the above as context Andrews and Whelan will examine ideas of identity and difficulty through the lens of Andrews’ work. 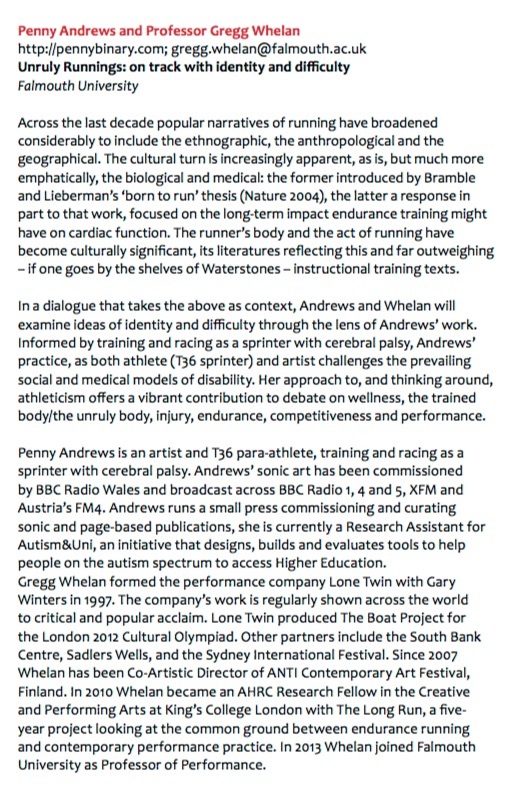 Informed by training and racing as a sprinter with cerebral palsy, Andrews’ practice, as both athlete (T36 sprinter) and artist, challenges the prevailing social and medical models of disability. Her approach to, and thinking around, athleticism offers a vibrant contribution to debate on wellness, the trained body/the unruly body, injury, endurance, competitiveness and performance. 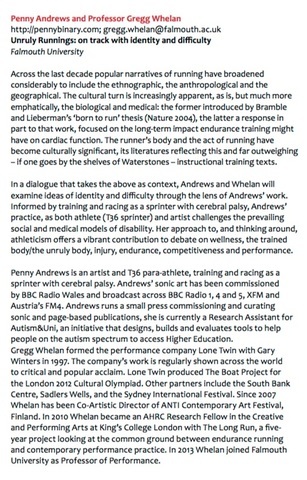 Penny Andrews is an artist and T36 para-athlete, training and racing as a sprinter with cerebral palsy. Andrews’ sonic art has been commissioned by BBC Radio Wales and broadcast across BBC Radio 1, 4 and 5, XFM and Austria’s FM4. Andrews runs a small press commissioning and curating sonic and page-based publications, she is currently a Research Assistant for Austism&Uni, an initiative that designs, builds and evaluates tools to help people on the autism spectrum to access Higher Education. Gregg Whelan formed the performance company Lone Twin with Gary Winters in 1997. The company’s work is regularly shown across the world to critical and popular acclaim. Lone Twin produced The Boat Project for the London 2012 Cultural Olympiad. Other partners include the South Bank Centre, Sadlers Wells, and the Sydney International Festival. Since 2007 Whelan has been Co-Artistic Director of ANTI Contemporary Art Festival, Finland. 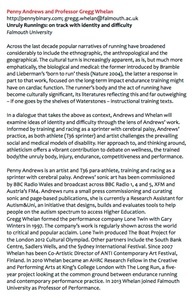 In 2010 Whelan became an AHRC Research Fellow in the Creative and Performing Arts at King’s College London with The Long Run, a five-year project looking at the common ground between endurance running and contemporary performance practice. In 2013 Whelan joined Falmouth University as Professor of Performance.